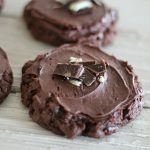 Triple Chocolate Mint Swig Cookies are the ultimate treat for any chocolate/mint lovers in your life. 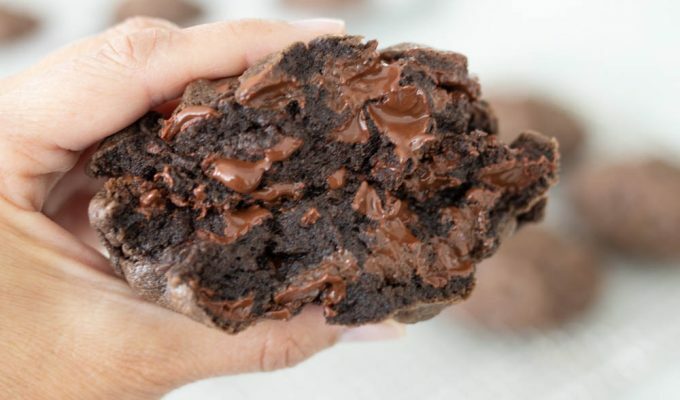 This dense chocolate cookie is under baked for extra fudgey goodness and topped with melted Andes Mints, frosted with a dark chocolate frosting and then topped with more chopped Andes Mints. It’s paradise in a cookie for all of the chocolate mint fans out there! If you are saying “What Swig obsession?” Go back and read this post before you proceed any further. There are four Swig variations I’ve come up with here on ABK: Lemon Lime Sprig Cookie,Chocolate Swagg Cookie, Coconut Cream Swig,and the updated Original (Almost) Swig Cookie(volume 2).And now, the Triple Chocolate Mint Swig. I think the world is divided into mint and non-mint lovers. Or maybe it’s chocolate and lemon lovers?? Whatever the case, I decided it was my duty to come up with a Swig cookie for mint lovers. Since I am not a huge mint fan, I turned to one of the three sources of mint I occasionally crave: Andes Mints, Jr. Mints and the Girls Scout Thin Mint cookie. I wanted to melt a thin layer of mint and chocolate on top of the baked cookie, and decided on the Andes Mint because it seemed like the best option for my Triple Chocolate Mint Swig Cookie. The first time I put this cookie together, I knew it was going to make a chocolate and mint lover a very happy person! Here’s the end result: dark chocolate cookie with semi sweet chocolate chips, topped with a melted Andes Mint, and finished off with a dark chocolate frosting. This cookie has turned me into a mint lover. The key to making a really delicious batch of this cookie is to not over bake the cookie. Bake just until the top has formed a crust and is no longer wet for best results! I know you’re going to love this cookie. And it’s perfect for St. Paddy’s day! A little green goes a long way. Preheat oven to 350 or 325 on convection setting. Add sour cream and vanilla. Mix. Add the cocoa and mix again until smooth. The mixture should be creamy, with no specks of white. Turn the mixer off. Add the flour, baking powder, salt and chocolate chips all at once. Mix just until all of the flour disappears, on the lowest setting. This should take about 10-15 seconds. Using a 1 3/4 inch to 2 inch scoop, place the dough onto a lightly greased cookie sheet. Lightly spray the bottom of a glass with cooking spray. First press the glass against a cookie, then dip the bottom of glass in sugar to flatten cookie a bit. Continue dipping the bottom of the glass into the sugar after flattening each cookie. After all of the cookies are flattened a bit, go back and lightly sprinkle sugar on top of each cookie. Bake for about 8 minutes at 325 convection, or about 10 minutes at 350. The cookies should be barely firm on top. The sugar sprinkled on top will form a light crust. Do not over bake! While cookies are baking, unwrap the mints and set aside. Remove the cookies from the oven. If the cookie has spread and is not as round as you would like, use a small spatula and push the edges back into a circle shape while still warm. Place two mints on top of each cookie. The mint will melt a bit. After about 2-3 minutes, use a butter knife to evenly spread the melted mint on top of the cookie. Let the cookies cool completely on cookie sheet. If you want to speed up the process of cooling the cookies and mints, place in refrigerator or freezer. Frost when the mint has set up on top of the cookies. After frosting, chop a few of the leftover mints and garnish the top of the frosted cookie. Cream butter, sour cream and powdered sugar. Add cocoa and vanilla, beat until smooth. Thin frosting with milk a tablespoon at a time until desired consistency. Top with chopped mints. -To achieve an edge on the cookie, or "lip" * :1. Generously fill the cookie scoop, extra dough will help form an outer edge on the cookie.2. Choose a glass with a flat bottom. Look at the bottom of the glass, if the bottom is not flat, the dough will not press out properly.3. I use a 2 1/4 inch glass bottom.4. Flatten the cookie ball with the bottom of the glass, twisting the glass gently as you flatten the dough ball. The dough should no longer be mounded. The cookie should be about 1/4 inch thick after flattening with glass.-I use Dutch Process Cocoa, which I highly recommend for this cookie.-This cookie will keep well refrigerated for a few days. Frost after cool, refrigerate in a single layer until the frosting is set, then stack in layers between parchment or wax paper, cover tightly.-Be very careful to not over bake this cookie. It will be slightly firm to the touch when done. Because the cookie is so dark in color, it cannot be judged by color when it is finished baking.-You may also skip the frosting step and simply let the mint melt on top of the baked cookie. Spread around a bit. The cookie will look like the second photo from the top of the post. Is there a way to make these without shortening? That's an ingredient we like to skip out on in our house.. but the cookie otherwise seems wonderful. You may make these with either all butter or vegetable oil instead of shortening or a shortening combo. The texture will be slightly different, but they will still be wonderful! Let us know if you try them out 🙂 Happy baking! Mel, I’m not a big mint fan and I think these are delicious as well! Thanks for reading ABK! I just tried making these for the first time! They are now on my “Top 3 List” of favorite cookies. I brought them to a college reunion get together last night…they were the HIT of the party. Thanks SO much (again) for sharing your scrumptious recipes.